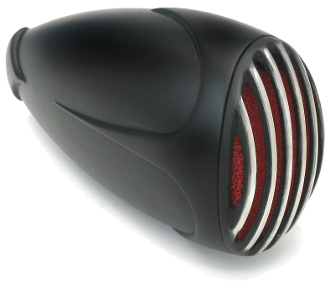 Our new “Rapide” air cleaner features a distinctive scallop design and grill, just like our matching tail light and head light. This is a clean black powder coat version. The Rapide air cleaner fits both S&S Super E or G, or stock CV carbs. It can be used with a Mikuni card with an adapter, which we can provide. This air cleaner includes the powder coat black body, grill, mounting plate, stainless attachment clip, stainless filter support screen, all stainless hardware and one gray filter element (no red filters are available). This onne comes as a black body and black grill. This item measures approximately 9.5" wide X 2.5" deep X 5.0" high.